What the Heck Is A Power of Attorney And How Does It Work For Board Meetings? Blog article by David C. Swedelson, Esq. On occasion, a director will seek to appoint another person to attend board meetings on their behalf (and make board decisions and vote as if they were a board member), or a homeowner’s friend or relative will attend the homeowners forum and attempt to speak on the homeowner’s behalf. 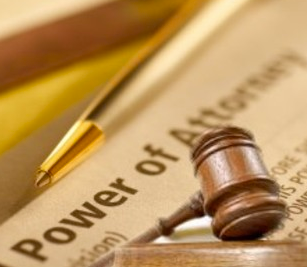 This article is intended to address and explain the concept of “Power of Attorney”, or in other words, the ability for a person to appoint a representative to act on their behalf. Can a representative attend executive or open session meetings and sit in the director’s seat, make and vote on items of business within the board’s authority? First, you should check your association’s bylaws to see whether there are any requirements to serve as a director. Often, there will be requirements such as: the board member must be in “good standing” (e.g., be current in the payment of assessments), or the board member must be a record owner of a separate interest within the community, among other requirements. When a director appoints a representative, especially one who does not meet the requirements stated in the bylaws, the director is effectively circumventing those requirements. To put it another way, running for President of the United States requires that you be a natural born citizen. If you are a Canadian citizen holding a Power of Attorney for an American citizen, you are not qualified to run for President, nor can you conduct the President’s affairs by virtue of your position via a Power of Attorney. In short, if the representative does not meet the requirements stated in the bylaws, the answer is clear and the representative cannot represent the director at board meetings. If the representative does meet the requirements stated in the bylaws, he/she still cannot represent the director at board meetings, as fiduciary duties cannot be delegated. Expanding on the previous statement, directors owe fiduciary duties to the association, which require the director (and not a representative) to act within the scope of his/her duties, to act in good faith, to act in a manner that he/she believes to be in the best interest of the association, etc. These duties impose a duty on the director, which cannot be delegated to a representative. So, if a director seeks to appoint another person to act on his/her behalf, that request should be denied. It should be pointed out to the board member why they cannot delegate their fiduciary responsibilities and the very big possibility that they will not be covered by the Association’s directors and officers insurance liability policy. Can non-owner representatives speak at homeowners forum? Then, review your CC&Rs to determine the definition of “member.” Usually, CC&Rs define members as persons who own a separate interest within the association. Then, by pairing the Civil Code and CC&Rs together, the Board can prohibit representatives from speaking at the Homeowners Forum. The board should also consider adopting Board Meeting and Homeowner Forum Rules. In these Rules, the board can spell out how it will conduct the meetings. You should include language that only allows record owners to speak at meetings, not tenants, residents, invitees, representatives, etc. If your association does not have such a Rule, talk with legal counsel or contact our office, as we can prepare them for your association. David Swedelson is a condo lawyer and HOA attorney; he can be contacted via email: dcs@sghoalaw.com.